While poking around online, I discovered that I was late to a very cool party. It seems that Good Old Games managed to hunt down and secure the licensing rights to the classic “Gold Box” games from SSI built around the Dungeons and Dragons world. Now, to many of you, this means nothing. To me, however, this ushered in a surge of memories from my youth. 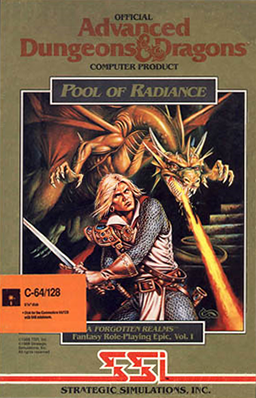 I played the “Pool of Radiance” series (as I called it”) on my Commodore 64 from the time the Gold Box Series came out until well into my college years. Holy smokes. Stopping to think about that, I just realized I played that series starting in 1988 (freshman year) up until a couple years after my wife and I got married. We married in 1991, but I played the game at least until 1993 or later. I loved the game. It was based on REAL D&D rules, regs, characters, stats… It combined two of my favorite things: computers and D&D. I fired up the game and began creating my characters and building a party. The first character I created was a female fighter. She was awesome from the very start. She had pixelated flowing blonde hair, was a tough character through stats, and became the undisputed leader of the party. I named her Angelica. She led battles, did most of the speaking for the group when put into such situations, and remained throughout the entire series – though others had not. Alas, it is not meant to be. You see, if I do buy the revamped games, I don’t think I could bring myself to create a new lead female character bearing the name and likeness of the one I had grown so fond of, the one who survived each of the games into which we could move our characters, allowing them to keep growing as new challenges arose from the disks contained inside those gold box games. No, you see, sometimes you play with a certain character in a game series so long that when the time comes for that character to rest (she never died, the series just ran out and time moved on and I eventually got rid of all my Commodore 64 stuff), you let the character rest. Creating another wouldn’t be the same. And, if the replacement didn’t live up to the same level as the original, then the memory of the first is forever tarnished. Angelica lives in my heart and memory the way she was: strong, fierce, pixelated beauty. When I was very young, perhaps not even in kindergarten or maybe a little older, my brother and I went to visit my cousin for a sleepover. At least, I think it was a sleepover – we may have just been spending the day. In any case, we were very young and the city was resurfacing roads in and around their house. So, the three of us decided to go down to the curb and play in the puddle. The puddle was, of course, tar from the roadwork. I remember very little of the incident, other than being covered in the black stuff basically from head to toe. I am sure we had it in our hair, all over our bodies, and who knows where else. What I also remember is taking a bath (or what seemed like a bath) in Turpentine to get it off. I’m not sure what prompted that memory just now, but there it is. Of course, in this day and age, child services would have been called long before we even had an ounce of tar on us just for being that close to the road. I am sure, however, the entire adventure had a lesson in it that I’ve carried the rest of my life. I suppose, if anything, I learned not to play in a pool of tar.